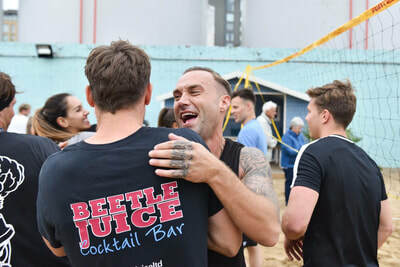 Taylor Morris Uk Beach Volleyball 2017 — Beetle Juice | The original VW cocktail bar - we bring the party to you! This week we had the privilege of shaking up a storm for the Taylor Morris team and their friends. The Stylish Uk sunglass company held the beach volleyball tournament at the fantastic Neverland venue in Fulham, London. Even better they asked us to bring our own team. How could we possibly resist that. We ended up finishing second overall but it didn’t matter, after all i’m not sure anyone will remember after the night of cocktails that followed!